Recently, I've been growing increasingly dissatisfied with the feel of the standard Apple keyboard. There are a number of things I could say on this topic, but the short story is that I feel like it's causing unnecessary strain on my hands. Since this keyboard is starting to die a slow death anyway (the left side modifier keys are starting to flake out), I decided to buy a mechanical keyboard to replace it. I'd tried this once before, with the CODE keyboard from WASD, but it came with Cherry MX Clear switches and, it turns out, I am not at all a fan of clear switches. They feel weird - tactile bump without the click just isn't something I can get used to. It makes the keyboard feel... kind of squishy. So I ordered a few different test switches and have decided on Cherry MX Blues - I leaned heavily toward greens for a long time because I love the feel of them, but since the goal of switching is to reduce hand strain, the blues seem like a better choice, long-term. they require 30g less actuation force. I agonized over this decision for days - do I go tenkeyless or get a full size keyboard? 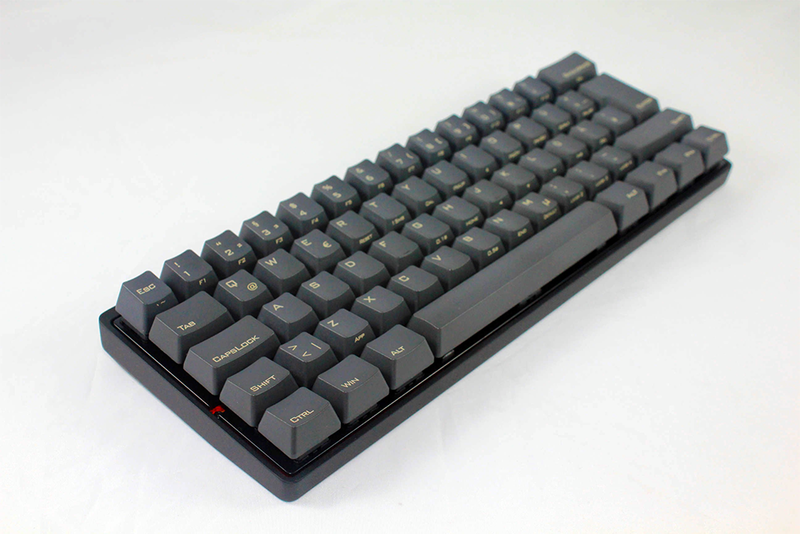 Do I get stock ABS keycaps, or do I spring for the higher quality PBT keycaps? Do I want a white keyboard, or a black one? Backlight, or no backlight? I researched the pros and cons of these options to no end and watched a ton of keyboard reviews on YouTube. Mechanical keyboards are expensive. I didn't want to make a purchase I'd regret, and I naturally tend to over-analyze decisions like this, anyway. I even toyed with the idea of forcing myself to learn DVORAK to minimize the amount of movement my hands have to do, but I quickly gave that up, because with a typing speed of ~110 WPM, I don't want to start all over from scratch. QWERTY would be super hard to un-learn at this stage of my life, I think and would slow me down at work for potentially months. Then I stopped and looked at how I actually use the keyboard. It was then that I realized that, aside from the arrow keys and the delete key, my hands never stray from the main 61 key cluster. My curiosity piqued, I downloaded Karabiner (a Mac key remapping utility) and pulled up the keyboard preferences to do some tweaking. I adjusted modifier key settings in the system preferences, remapped arrow keys to WASD on the function layer, and set some specific Mission Control shortcuts that had used arrow keys to other key combinations. I opened Sublime Text and found that I really only needed to change one pair of keyboard shortcuts to accommodate the different layout, so I swapped those around. It's been two days. The new key mappings don't feel 100% natural yet, but I don't hate them, either. They do keep my hands from straying from the home row. Something about it actually feels really good. I like it. So I've pre-ordered a Poker 3 - a 60% keyboard with a metal casing, Cherry MX blue switches, laser-etched PBT keycaps, and no backlight (on the version I ordered). This will either turn out really well, or really badly.